During her past 25 years as a concert singer, Julia Barthe has continuously and intensely applied herself to Lied repertoire. In doing so she has sought clarity in the use of the voice and depth with regard to her interpretation of this important genre. In the process, she has repeatedly come across a series of Lieder cycles. She has recorded those most important to her in the past years. In the "Schumann year", 2010, she recorded "Frauenliebe und - leben", the song cycle by Robert Schumann, Op. 39, based on poems by Joseph Eichendorff and Mary Stuart. She is accompanied at the piano by Martin Schumann (professor at the Music and Theatre college in Hamburg). For the Wagner year in 2013 an exciting combination of late romantic and early modern songs was set around the Richard Wagner's Wesendonk Lieder: the Mignon Lieder by Hugo Wolf, as well as compositions by Arnold Schönberg (Lieder Op.2), Alban Berg (7 Frühe Lieder) and Anton Webern (Lieder op.3). 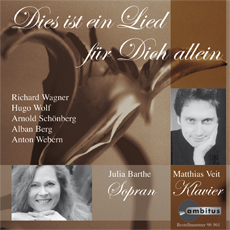 Julia Barthe was able to win Matthias Veit for this recording, the internationally renowned Lied accompanist.